David was from Cheyney Rock, Isle of Sheppey Kent, and Savage Gardens. He owned oyster fisheries and is said to have been beneficent with the wealth he amassed from these. Alston David Thomas - Oyster Merchant 15 Savage Gardens. Green & others v Alston & others. This was an action brought against the late Mr Alston & others by the night oyster meters of the corporation of London for payment of 265L 12s for work at Billingsgate & Hungerford Markets in 1852/53/54 of meting, landing, & unloading shellfish. In 1852 Mr Alston had set his face against the claim of the night meters, he had in fact paid the day meters a parallel group working different hours who had established a claim to the payment. Counsel for the defendants described the plaintiffs claim as an usurpation, inspite of the night oyster meters claim of a long and established right and privilage for which they had paid large fees. The jury retired for half an hour and then returned a general verdict for the defendants. Died 28 Nov. 1855 aged 56 David Thos. Alston Esq. of Savage Gardens and owner of the extensive Cheyney Rock Oyster Fishery Isle of Sheppey. A man of great wealth, he employed it to the benefit of all about him. He married. a niece of Mr. Alderman Harmer. Alston v Alston. Bill and two answers. [MRFA Two bills]. This cause again came on upon motion. The parties were brothers, the plaintiff David Thomas, and the defendant David, Alston. Their father William Alston of Rochester who died in May 1833 by his will of April 21 preceding, devised his freehold lands, grounds, sea-shore, and fishery, called Cheyney Rock, in Minster, in the Isle of Sheppey, Kent, and all his lands, ground, soil, and fisheries, as to one moiety, to the use of his son David Thomas, the plaintiff, for life, with the remainder over; and as to the other moiety, to the use of his son, the defendant for life with remainder over for their respective families. The two brothers continued their father's business of oyster merchants in equal moieties, and entered into articles of partnership, which were dated April 1835. Disputes arose, the bill for a dissolution was filed, and the present motion was by the plaintiff for a reference to the Master to appoint a receiver to get in the debts, to appoint a manager to manage the oyster grounds, and to dredge and carry to market the stock of oysters until the partnership affairs were wound up, to employee the vessels, craft, and implements for that purpose, to pass their accounts, and to pay the balance into court. The case was argued at length by Mr Pemberton and Mr Wilcock for the plaintiff and by Mr Turner and Mr Bacon for the defendant. The Bill was originally filed to have the partnership dissolved, but was afterwards amended to have it declared that by the effect of the notice given by the plaintiff the partnership was dissolved. The articles declared, that if either party should be desirous to determine the partnership, it should be lawful to do so upon giving a notice in writing, and thereupon the same should be immediately dissolved. The plaintiff on the third of February last served the defendant with notice of dissolution. It was stated by the defendant to be necessary for carrying on the business that a stock of oyster spat or brood oysters, should be deposited upon the grounds that they might there grow and fatten, and be rendered in due time marketable; and that the neglecting such deposit at the proper season would be, not only to lose the profit, but to diminish the value of the grounds; and that the season for doing this began in February, and continued until the end of May. When the plaintiff gave his notice this season had begun; and the defendant, to preserve the common property, was desirous that the process should go on, but the plaintiff refused to allow it. For the plaintiff it was stated, that he had no confidence in the defendant's management, but insisted upon the dissolution according to the terms of the articles; and the employment of the partnership funds in depositing oyster spat upon the grounds was complained of; and it was urged that when the notice of dissolution was given on the third of February 8 time when no inconvenience could arise and before the expense of stocking the ground was incurred, the defendant refused to concur with measures for winding up the concern. Mr Turner requested the liberty for the defendant to propose himself as manager. Lord Langdale said the rule was not to allow it. The Times: Saturday Jul 9 1842. Rolls Court, Westminster, Monday, June 12. Mr Pemberton Leigh (and Mr Wilcock with him) said that William Alston the late father of the plaintiff, David Thomas Alston, and the defendant, David Alston, devised his oyster grounds on Cheyney Rock, in the Isle of Sheppey and other grounds, to the plaintiff and defendant, absolutely between them, with his boat's craft etc. He died in 1833. In April 1836, the two brothers executed a partnership deed, by which it was provided that the partnership should, upon notice, be immediately dissolved. Differences arose, and notice was given in February, 1842, so it became necessary to have the account is taken and a division made. The deed provided that where an equal division of the oyster beds could not be made a rent should be paid by the party retaining the most valuable portion. A design of division could not be made, because, when the wind was high, the oysters were driven in shoals. Lord Langdale: Was the chance equal, or did the wind blow oftener one way. Mr Pemberton Leigh: It blew more one way. Neither party derived a sale. The plaintiff prayed for a declaration that the partnership was dissolved by the notice, that the properly should be divided according to the terms of the deed, to each partner in severality, and for a reference to the Master. Mr Turner appeared for the defendant. Lord Langdale made the decree, reserving further directions. The Times 13 June 1843. In 1965/6 the Manningtree church was demolished and housing built on the site, in the process the grave yard memorials were lost and the deceased exhumed and reburied in Mistly churchyard. England Return of Owners of Land 1873. Kent. Alston D T. (Exors) Minster 23a 3r 22p gross estimated rental value. L507. Alston David T. Southend 219a 3r 24p gross estimated rental value. L60. This is an uncertain placement as David died in 1855. Copy of Will on this file PROB 11/2249 to be transcribed. Dated 27 Mar 1855 it was proved 1 April 1857 by Mary his relict. Sometimes refered to as Cheyney House (126, Marine Parade) & Rock House (124, Marine Parade) but under the same roof was once the headquarters of the Cheyney Rock Oyster Fishery. Built around 1816, by William Alston as a headquarters for his business interests, with a house, it was lived in by his sons David Thomas & David Alston. 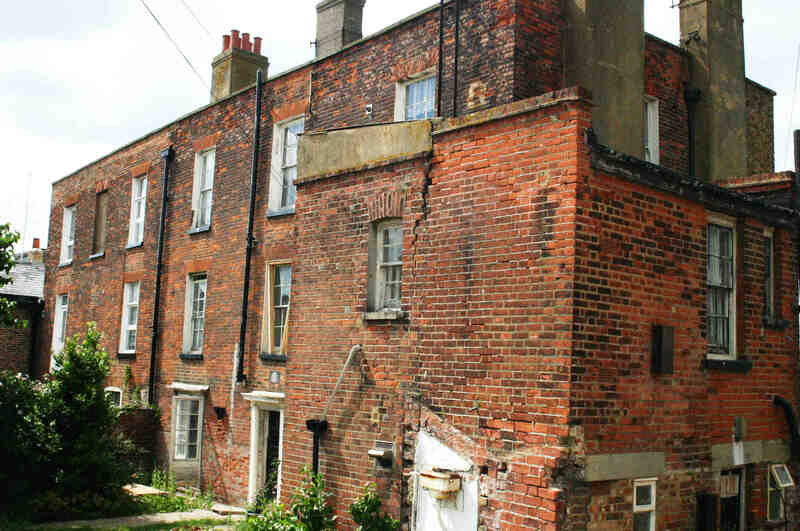 Adjoining to south west is a stable block of 2 storeys buff brick with hipped slate roof. 7 sashes, mostly with verticals only. 1 square 4-light bay on the ground floor and hipped slate weatherporch. It is all now a Grade II listed building. See the wonderful images of Cheyney Rock House. "Cutter rigged smacks sailed from the Medway where Alston's oyster dredgers brought home Channel oysters before they moved to Leigh-on-Sea. Small oyster dredging cutters worked from Whitstable and the Swale, generally resembling the Colne smacks but were fuller bottomed to take the hard foreshore which served their harbour. They set a generous rig but could easily be distinguished from the Essexmen by their square, boxy counters and the large ports cut in the bulwarks to shovel the oyster shell and culch overboard."